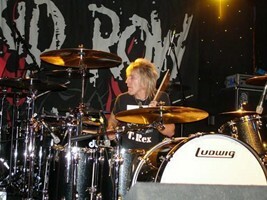 In April of 2010 Skid Row and drummer Dave Gara parted ways. Now Skid Row have recruited Atlanta native Rob Hammersmith as their new drummer. “We wish Davee all the best for the furture and we are very excited to begin working with Rob” said lead singer Johnny Solinger. Snake Sabo added “Lets put it this way, we gave him (Rob) a lot of songs to learn and not much time to learn them, but he came through like a champ”. Rob spent many years touring and recording with Atlanta based rockers “Rockets to Ruin” and toured with “Gunfire 76” featuring Wednesday 13.